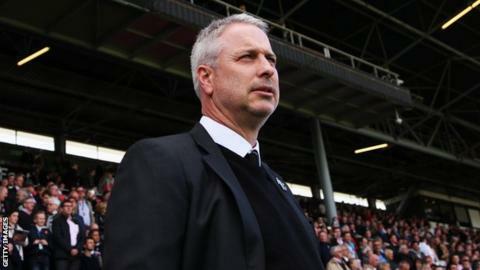 Kit Symons should remain as Fulham manager and be fully backed by the club's board, according to former Whites midfielder Sean Davis. Former Wales defender Symons, 44, kept the club in the Championship after taking charge in September, when Fulham were bottom of the table. "There is a bit of uncertainty over whether Kit will be here or not," Davis told BBC London 94.9. "They need to be fully behind him and give him the resources that he needs." Fulham, who were relegated from the Premier League last season, had picked up just one point from their first seven league matches this season when Symons replaced Felix Magath as manager, initially on an interim basis. In October, he was given a deal until the summer of 2016 after the club took 13 points from a possible 21. The Craven Cottage side eventually finished 17th in the table, 11 points above the relegation zone, but there has been speculation that Symons may be replaced as manager this summer. However Davis, who played alongside Symons at Fulham for three years, believes chairman Shahid Khan should retain his services. "Some people say Kit started well but then drifted off," added the 35-year-old, who is now retired. "This club has done well over the years by sticking to a manager and being patient with him. "There was a period in the Premier League where they got through three or four [quickly] and just wasn't Fulham-like. It didn't seem like the same club. "The owner should give Kit the resources he feels he needs to get Fulham in the play-offs or be promoted and take it from there." Davis believes Fulham's summer recruitment will be key if they are to challenge for a return to the Premier League. The club have already extended the contract of Costa Rica international Bryan Ruiz until the summer of 2016. "The positive is we stayed up and blooded a lot of young players," said Davis, who scored 20 goals in 198 appearances for Fulham between 1996 and 2004. "The young players have seen what the Championship is all about, had that grounding and will be better for the experience. "The recruitment has got to be spot on for next season. An experienced Championship side always does well - one with players who have played in the league and know it." Davis was speaking to BBC London 94.9 ahead of the Fulham All Stars v Celebrity All Stars charity football match at Craven Cottage on Saturday, proceeds from which will go to the Fulham FC Foundation and Shooting Star Chase.